A fishfinder or sounder (Australia) is an instrument used to locate fish underwater by detecting reflected pulses of sound energy, as in sonar. 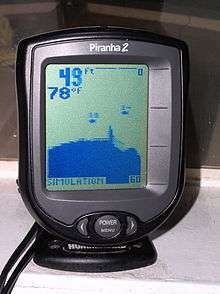 A modern fishfinder displays measurements of reflected sound on a graphical display, allowing an operator to interpret information to locate schools of fish, underwater debris, and the bottom of body of water. Fishfinder instruments are used both by sport and commercial fishermen. Modern electronics allows a high degree of integration between the fishfinder system, marine radar, compass and GPS navigation systems. Fish finders were derived from fathometers, active sonar instruments used for navigation and safety to determine the depth of water. The fathom is a unit of water depth, from which the instrument gets its name. The fathometer is an echo sounding system for measurement of water depth. A fathometer will display water depth and can make an automatic permanent record of measurements. Since both fathometers and fishfinders work the same way, and use similar frequencies and can detect both the bottom and fish, the instruments have merged. The temperature and pressure sensitivity capability of fish finder units allow one to identify the exact location of the fish in the water by the use of a temperature gauge. 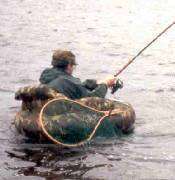 Functionality present in many modern fish finders also have track back capabilities in order to check the changes in movement in order to switch position and location whilst fishing. The image above, at right, clearly shows the bottom structure—plants, sediments and hard bottom are discernible on sonar plots of sufficiently high power and appropriate frequency. Slightly more than halfway up from the bottom to the left of the screen centre and about a third away from the left side, this image is also displaying a fish – a light spot just to the right of a 'glare' splash from the camera's flashbulb. 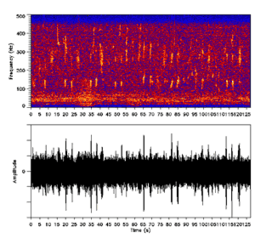 The X-axis of the image represents time, oldest (and behind the soundhead) to the left, most recent bottom (and current location) on the right; thus the fish is now well behind the transducer, and the vessel is now passing over a dip in the ocean floor or has just left it behind. The resulting distortion depends on both the speed of the vessel and how often the image is updated by the echo sounder. With the Fish Symbol feature disabled, an angler can learn to distinguish between fish, vegetation, schools of baitfish or forage fish, debris, etc. Fish will usually appear on the screen as an arch. This is because the distance between the fish and the transducer changes as the boat passes over the fish (or the fish swims under the boat). When the fish enters the leading edge of the sonar beam, a display pixel is turned on. As the fish swims toward the centre of the beam, the distance to the fish decreases, turning on pixels at shallower depths. When the fish swims directly under the transducer, it is closer to the boat so the stronger signal shows a thicker line. As the fish swims away from the transducer, the distance increases, which shows as progressively deeper pixels. The image to the right shows a school of white bass aggressively feeding on a school of threadfin shad. Note the school of baitfish near the bottom. When threatened, baitfish form a tightly packed school, as the individuals seek safety in the center of the school. This typically looks like an irregularly shaped ball or thumbprint on the fishfinder screen. When no predators are nearby, a school of baitfish frequently appears as a thin horizontal line across the screen, at the depth where the temperature and oxygen levels are optimal. The nearly-vertical lines near the right edge of the screen show the path of fishing lures falling to the bottom. Early sporting fathometers for recreational boating used a rotating light at the edge of a circle which flashed in sync with the received echo, which in turn corresponded to depth. These also gave a small flickering flash for echos off of fish. Like today's low-end digital fathometers, they kept no record of the depth over time and provided no information about bottom structure. They had poor accuracy, especially in rough water, and were hard to read in bright light. Despite the limitations, they were still usable for rough estimates of depth, such as for verifying that the boat had not drifted into an unsafe area. Eventually, CRTs were married with a fathometer for commercial fishing and the fishfinder was born. With the advent of large LCD arrays, the high power requirements of a CRT gave way to the LCD in the early 1990s and fishfinding fathometers reached the sporting markets. Nowadays, many fishfinders available for hobby fishers have color LCD screens, built-in GPS, charting capabilities, and come bundled with transducers. Today, sporting fishfinders lack only the permanent record of the big ship navigational fathometer, and that is available in high end units that can use the ubiquitous computer to store that record as well. Commercial and naval fathometers of yesteryear used a strip chart recorder where an advancing roll of paper was marked by a stylus to make a permanent copy of the depth, usually with some means of also recording time (Each mark or time 'tic' is proportional to distance traveled) so that the strip charts could be readily compared to navigation charts and maneuvering logs (speed changes). Much of the world's ocean depths have been mapped using such recording strips. Fathometers of this type usually offered multiple (chart advance) speed settings, and sometimes, multiple frequencies as well. (Deep Ocean—Low Frequency carries better, Shallows—high frequency shows smaller structures (like fish, submerged reefs, wrecks, or other bottom composition features of interest.) At high frequency settings, high chart speeds, such fathometers give a picture of the bottom and any intervening large or schooling fish that can be related to position. Fathometers of the constant recording type are still mandated for all large vessels (100+ tons displacement) in restricted waters (i.e. generally, within 15 miles (24 km) of land). ↑ Hodges, Richard P. (2013). Underwater Acoustics: Analysis, Design and Performance of Sonar. Hoboken, N.J.: John Wiley & Sons. ISBN 9781119957492. Retrieved 4 July 2016. ↑ Everett V. Richardson, Peter F. Lagasse (1 January 1999). Stream Stability and Scour at Highway Bridges. ASCE Publications. p. 515. ISBN 0784474656. Retrieved 1 March 2015. ↑ Jackson, Darrell; Richardson, Michael (2007). High-frequency seafloor acoustics (1. ed.). New York: Springer. p. 458. ISBN 0387369457. ↑ Editing Board. "Fish-finder". Encyclopædia Britannica. Retrieved 4 July 2016. ↑ Julia, Hasty (5 June 2010). "Fishfinder: Specification, techniques and Guides". Fishfinder Magazine. Retrieved 4 July 2016. ↑ "Do fish finders come with transducers? · Fish'n Marine Center". Fish'n Marine Center. Retrieved 2016-02-03. Post-war economics: Fisherman who caught multibillion-dollar deal Financial Times, 9 December 2009.